If you are an avid Disney fan, you are probably familiar with Club 33. It's an exclusive club built for the original investors of Disneyland. Did you know that there is a Club 55? It is not a physical location in the park but a club that represents the original cast members that worked Disneyland when the park opened or in the year 1955. There are currently 20 cast members in the club and one by one they retired from Disneyland. The last one to retire was Bob Penfield. He was a project manager for Disneyland when the park opened. You may have noticed whimsical signs above some of the shops on Mainstreet USA. Each of the window signs indicate a important piece of Disneyland history. 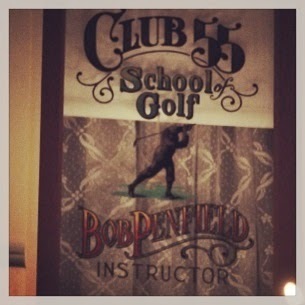 Bob Penfield has one above the Coca Cola cafe that says Club 55, Bob Penfield, School of Golf- Instructor. This is a remembrance of the annual Club 55 Golf Tournament that he helped organize in 1990. The next time you walk down Mainstreet, look above the shops and see the history to be found.